Can I a get a reeeeeee-Vine? Twitter's Vine app is seemingly ready to meet the threat of Video on Instagram head on, after launching a significant update for iPhone today. The headlining feature within the update, which the company says is its biggest yet, is the introduction of 'revining' which, like retweeting, allows users to share Vine videos they enjoy among their own followers. 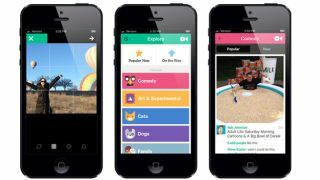 The company hopes this will help popular Vines become more visibile among the community of users by going viral. Discovery is also emphasised by the new Explore section, which allows users to view videos that are popular, on the rise, or tagged with specific terms. Creators can now post to specific channels like Comedy or Cats too! However, it's not all about showcasing the posts of others. Perhaps wounded by the assertions that Instagram's video shooting experience is superior, Vine has updated camera functions too. There's now a redesigned shooting UI, the addition of a photo grid and a focus button and the addition of a 'Ghost' button, which showcases the last frame of the previous shot. Each of those additions will be welcomed, in particular, by those using the app for stop-motion animations, where it's important to frame the shot perfectly and track the movement of your subject from one shot to the next. Vine has also added greater security for shy users by introducing protected accounts that, like Twitter, allow users to approve new followers before they can view their posts. The new features are for Vine's iPhone app at present, but the company says they'll be introduced to Android soon, starting with the protected posts feature today, and continuing next week.